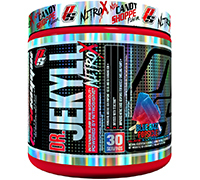 ProSupps Dr. Jekyll NitroX is the ultimate low-stimulant, pump-inducing pre-workout formula that combines an unrivaled nitric oxide response blend with a focal matrix for pinpoint focus and drive. Stronger than ever, Dr. Jekyll NitroX promotes maximal pumps, vascularity, strength, mental focus, and sustained energy. Transform with Dr. Jekyll NitroX, the ultimate pump-focused pre-workout. 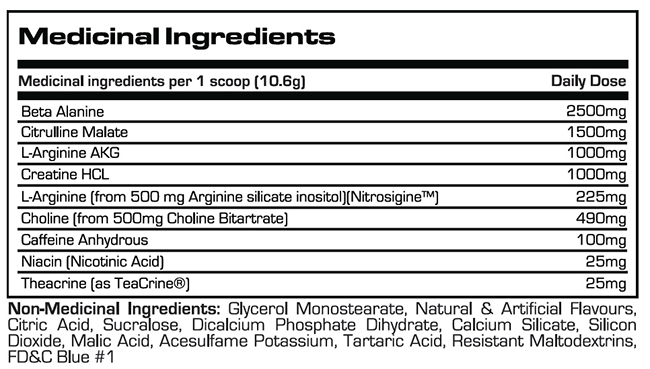 Other Ingredients: Natural & Artificial Flavors, Sucralose, Citric Acid, Calcium Silicate, Silicon Dioxide, Malic Acid, Soluble Dietary Fiber, Acesulfame Potassium, Tartaric Acid, FD&C Blue #1. Store in a cool, dry place, content sold by weight not volume; some settling may occur. Protect from heat, light, and moisture.